Map of the Citronen Zinc-Lead project in Greenland, courtesy of Ironbark Zinc Limited. The potential for mining in Greenland is enormous, but since 2013, when the Nalunaq gold mine closed, the sprawling Arctic island with ties to Denmark has not built any new mines. That could change though, thanks to a mining permit issued this week by the Greenland Government to Ironbark Zinc Limited (ASX:IBG), which is advancing one of the world's largest undeveloped lead-zinc deposits. The permit gives Ironbark the right to explore and mine its Cirtronen Zinc-Lead Project for 30 years. The permit also comes with the condition that Ironbark enter into a net smelter royalty agreement with the government, that is 1% for the first two years of production and rises incrementally up to 2% in the fourth production year and 2.5% thereafter. In 2013 Ironbark released a feasibility study showing the mostly-underground, room and pillar operation would have a capital cost of $429.3 million including contingency, and a minelife of 14 years. "We are proud and delighted to have been awarded the Mining Permit for the World Class Citronen ZincLead Project. This is a milestone and achievement of great importance to the Company and our plans to develop the project into one of the world’s largest zinc mining operations. We will now move to advance project development and funding without delay," Ironbark Managing Director Jonathan Downes said in a statement. The $41 million market-cap company has two other projects in Greenland and three in Australia. According to a project page, the Citronen Zinc-Lead Project represents one of the world’s largest undeveloped zinc-lead resources with a resource in excess of 13 billion pounds of contained zinc and lead. Over 67,000 metres of diamond drilling has been completed to date at the deposit located in Northern Greenland. In 2013 Ironbark released a feasibility study showing the mostly-underground, room and pillar operation would have a capital cost of $429.3 million including contingency, and a minelife of 14 years. It also said the company is working with China Non-Ferrous Metal Mining Group to deliver an EPC (engineering, procurement, construction) contract and financing for the project. The Arctic Journal reports that the mine is expected to employ 500 once operational, and that Ironbark intends to start construction in 2017 or 2018. The publication also notes that Greenland has approved six mining operations over the past eight years, but none are currently active. Two new mines though are expected to come online next year. 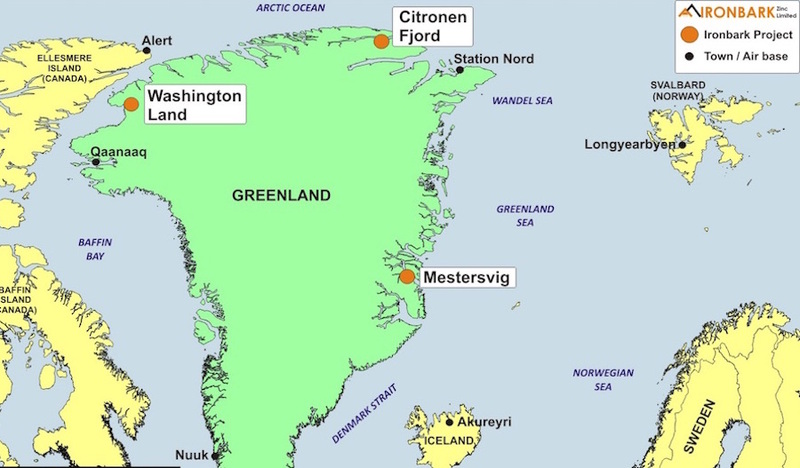 Citronen is the first "large-scale" mine to be approved, defined as mines costing more than 5 billion kroner and requiring more employees than are available in Greenland. Much of the debate over mining in Greenland, a self-governing Danish territory, centres around uranium. In 2013, four years after the island assumed full control over its mineral and hydrocarbon rights from Denmark, the Greenlandic parliament voted to remove the ban on radioactive materials, which opened the door to uranium and rare earth exploration. Removing the uranium mining ban was crucial for the development of the Kvanefjeld uranium and rare earth element project, being explored by Australia's Greenland Minerals and Energy (ASX:GGG) – considered to be one of the world's largest undeveloped deposits of REEs and uranium. About a year ago further progress towards uranium mining was made, with an agreement to export uranium from Greenland. The island has a a rich geological profile but is less explored than, say, Arctic Canada. Along with uranium, Greenland also has deposits of iron ore, nickel, copper, rare earths and gold. In 2012 North American Nickel (TSXV:NAN), said that its Greenland property is the remains of a gigantic, three-billion-year-old meteorite impact, and displays a similar geological formation that is found in the Sudbury Basin in Ontario, Canada – the second-largest impact crater on Earth.